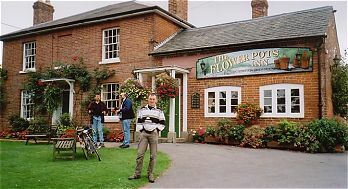 This pub is, without a shadow of a doubt, one of the best remaining examples of a traditional country pub. If you seek a place that welcomes all, that holds an unpretentious air and lacks fruit machines and intrusive recorded music then you'll be entering pub heaven as you pass within. But this place lives and the people that come here, come back again and again. This place is genuinely traditional unlike so many that have been made to look old 'because the discerning drinker and diner like that.' To add to this wonderful atmosphere, they brew their own beer on the premises under the name 'Cheriton' and these superb brews have rightfully won a whole host of awards that are proudly displayed on the walls within the pub. The brewhouse itself is relatively young, having been constructed as recently as 1993. The design however is strictly traditional and fits in well with the pub itself. The small homely rooms within the pub are usually filled with a wide mix of folk and in the winter the log fire really does give the pub a very cosy feel. During the summer the garden to the rear is the perfect place to relax and enjoy a pint of one of their beers that are served straight from the cask. There are rare occasions when I taste a beer and it totally and utterly hits the spot, it's what I refer to as a Classic Beer Moment (or CBM), and the Cheriton Pots Ale was one of those. It's their weakest beer at ABV 3.8% but its wonderfully hoppy nose and lasting hoppy taste was certainly one to relish. When I get a little more time, I'll document the other dozen or so CBM's that I've had and add them to a special page. Clearly such records are entirely personal and beers do vary between brews and the way in which they've been kept, but I feel it is important to document such occurrences as you may well repeat my experience! For those of you who are hungry as well the pub offers a simple range of bar food; sandwiches, soup, baked potatoes along with filling hotpots (not Sunday evenings). They also offer locally-made curries on Wednesday evenings. If you can't pull yourself away at the end of the evening, they offer good quality B & B. If you ask, they might even let you camp in the field next door which is particularly handy for their Beer Festival which they hold every August Bank Holiday.